After great anticipation, the 25th International Global Architecture and Interior Design Exhibition is here. 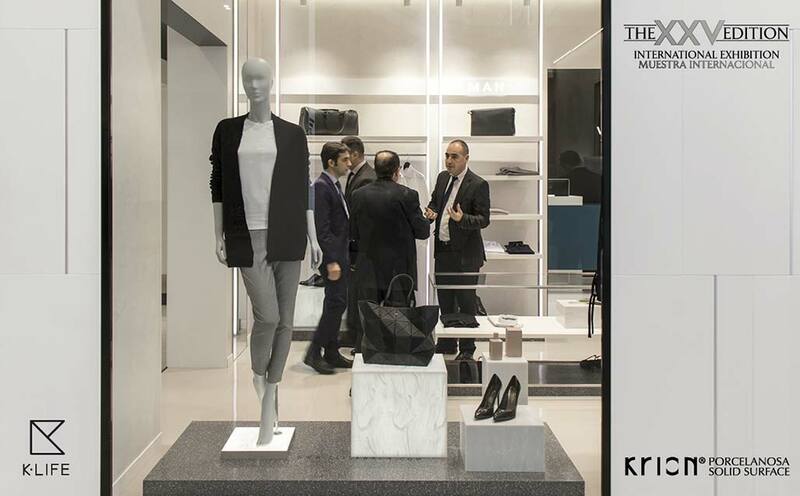 The silver anniversary ofPORCELANOSA Group with its exhibition has become a special date for all employees of the Group. Year after year, the 8 firms of the PORCELANOSA Group show off their new products, but on this occasion there has been even greater enthusiasm due to it being the 25th anniversary. After a quarter of a century in constant development, currently the sales sectors of SYSTEMPOOL are divided into three areas: SP BATH, KRION BATH and KRION PORCELANOSA SOLID SURFACE. In each one of these we offer various new products which we are displaying in over 2,000m2 divided into two exhibition floors. There are 16 new colours presented at the anticipated date of the 25th edition of the PORCELANOSA International Exhibition. These colours are divided between the existing series, and a new series has been created with four spectacular colours which can be backlit – OPALE – which we will see transformed into RETAIL spaces of different atmospheres: BOUTIQUE, OPTICIANS, FAST FOOD, ELECTRONICS and CLINIC. In this section, the new series are consolidated, increasing their number of products: New SLIM 160X75 bathtub, expansion of the PURE series (by Yonoh) with the PURE 158x49 countertop and the PURE ON TOP 60x40 washbasin with an overflow, and the frameless mirrors of three sizes – Ø82, 145x82 and 55x82. The importance of the USA market has led us to adapt to its regulations, having to duplicate many of the existing models to comply with their certifications, such as with the seasoned KOLE series, into which we have incorporated overflows in all sinks, duplicating the existing range, and similarly adapting the RAS shower tray and MODUL 80x45 countertop. A shower screen and two columns form the new products from SP BATH, the DECA series of shower screens expanding the collection. The main new product of this series is 10mm thick with robust aluminium profiles in a frosted silver colour. The TONO series from KRION BATH has grown with a column designed by Foster + Partners providing practicality and elegance. The TEC column, with its rounded and squared finishes, has the characteristic of being extendible.